Amazon’s Echo Dot is by far the least expensive way to add Alexa to your home in a high-quality speaker. It’s normally priced at just $50, which is obviously far cheaper than the $180 Amazon Echo. In fact, you can get three Dots for less than the cost of one Echo and still have money left over for dinner. Of course, Amazon loves to offer up an additional discount every now and then, and such is the case on Wednesday. 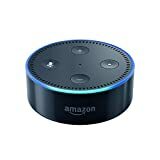 Today, for one day only, Amazon is slashing $10 off the price of the wildly popular Echo Dot. That drops the cost of a Dot to just $40, so you can now buy four and a half Dots for the price of a single Amazon Echo speaker. The offer is only good until midnight PDT tonight, so don’t let it slip away. And if you want to save an extra $2, you can get a refurbished Echo Dot right now for $38.